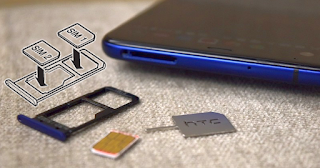 How to Insert SIM and Memory on HTC U Ultra - Here HTC U Ultra tutorial insert SIM and memory with tips and tricks. On HTC U Ultra, use a standard nano SIM card. Inserting a modified card that is thicker than the standard nano SIM card may cause the card to not fit properly or damage the card slot. 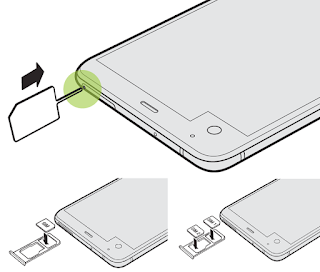 When inserting the eject tool into the HTC U Ultra tray eject hole to remove the card tray, make sure not to press on the tray to avoid damaging the eject mechanism inside the slot see the HTC U Ultra overview for more details. If you want to use a protective case, make sure to buy a case that's designed for HTC U Ultra and that doesn't block the tray. Hold the phone face up. 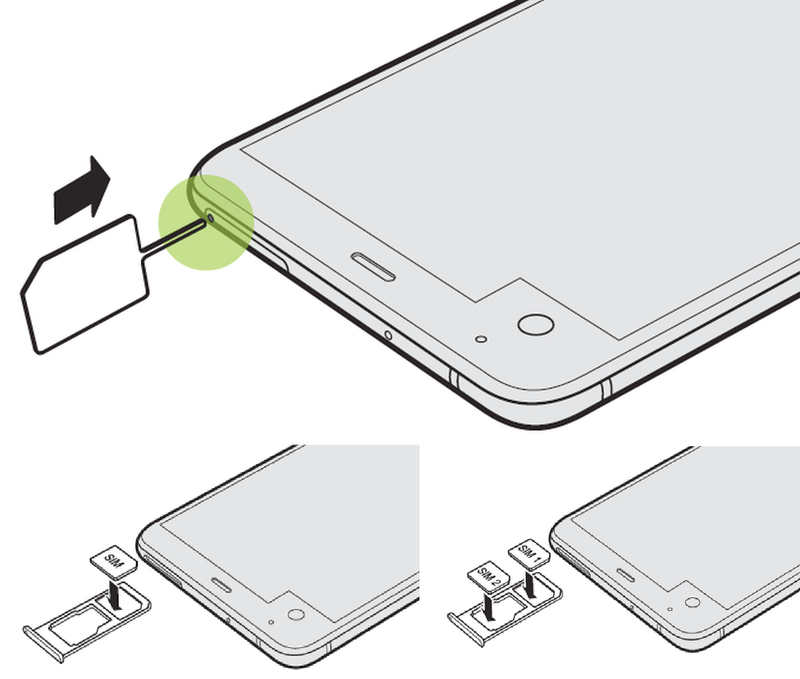 Insert the tip of the tray eject tool that came with your phone—or a small bent paperclip— into the tray eject hole. With your nano SIM card's gold contacts facing down, place the card into the SIM holder of the tray. Make sure to align the cutoff corner to the notch on the holder. Place your microSD™ card into the SD holder of the tray. With the gold contacts facing down, place your nano SIM cards into the SIM 1 and SIM 2 holders of the tray. Make sure to align the cutoff corners to the notches on the holders. By default, SIM 1 will connect to the 4G LTE/3G network, and SIM 2 will connect to 3G/2G. To find out how to set the preferred card for connecting to 4G LTE, you can Manage HTC U Ultra SIM cards with Dual network manager on settings. SIM 2 and SD are labeled on the same holder in the tray. Either place your second nano SIM card or a microSD card into this holder. Both cards can’t be inserted at the same time. When reinserting the tray, make sure it is facing up so that your cards don't fall out. Hold the tray with the outer card holder between your fingers, and then steadily slide the tray all the way into the slot. Press on the cover that's attached to the tray to close it tightly. Ensure to read HTC U Ultra Manual. Make sure follow the manual instructions below into switch off HTC U Ultra before removing the card. Insert the tip of the tray eject tool or a small bent paperclip into the tray eject hole. Push the tip all the way into the hole until the card tray ejects. Pull the tray out, and then remove the nano SIM card. To reinsert the tray, center it first in the slot, and then slide it all the way in. Use a storage card to store your photos, videos, and music. When you need to free up phone storage space, you can also move certain apps to the storage card, if the apps support this feature. The storage card is optional and sold separately. Insert the tip of the tray eject tool that came with your phone or a small bent paperclip, into the tray eject hole. Push the tip all the way into the hole until the tray ejects, and then pull the tray out. 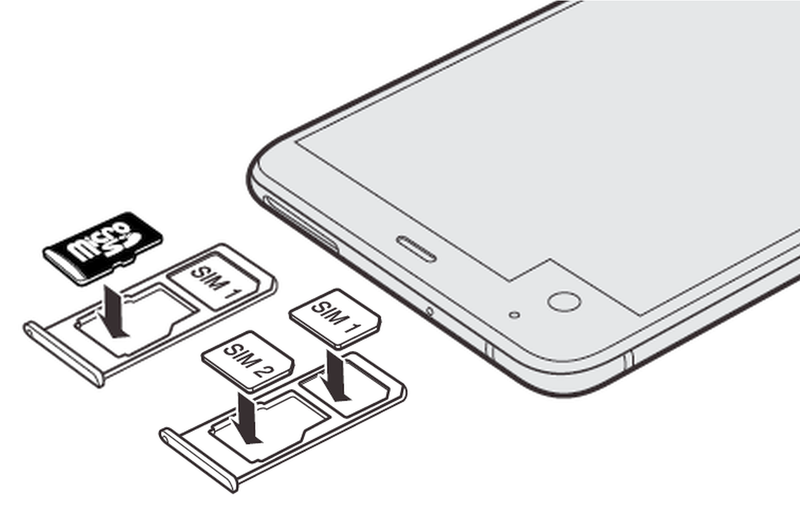 For Dual SIM model, SIM 2 and SD are labeled on the same holder in the tray. Remove your second nano SIM card when you want to use your microSD card. Both cards can’t be inserted at the same time. Place your microSD card, gold contacts facing down and narrow side facing in, into the SD holder of the tray. When reinserting the tray, make sure it is facing up so that the nano SIM and microSD cards don’t fall out. Hold the tray with the outer card holder between your fingers, and then steadily slide the tray all the way into the slot. If it's the first time you insert a microSD card, you'll be prompted to set it up. When you need to remove the storage card while HTC U Ultra is on, unmount the storage card first to prevent corrupting or damaging the files in the storage card. If your storage card is used as internal storage and there are apps that were moved to the card, you will not be able to open these apps after unmounting the card. From the Home screen, tap Settings Storage. If your storage card appears under Removable storage, tap next to the card name, and then tap Eject. If your storage card appears under Internal storage, tap the card name, and then tap Eject. Make sure follow this HTC U manual to unmount your microSD card before removing it. Insert the tip of the tray eject tool that came with your phone or a small bent paperclip into the tray eject hole. Push the tip all the way into the hole until the tray ejects. Pull the tray out, and remove the microSD card. 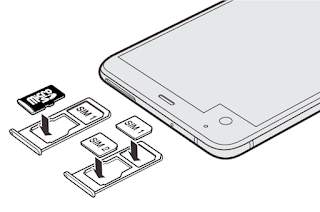 After removing the microSD card, make sure that you insert the empty tray back into the slot. Choosing which nano SIM card to connect to the 4G LTE network. When you have two nano SIM cards inserted on your phone, only one card can connect to the faster 4G LTE network. The other card will connect to the 3G/2G network. You can set which card you want to connect to the 4G LTE network. From the Home screen, tap Menu>Settings>Dual network manager. Choose the card you want to connect to the 4G LTE network. Managing your nano SIM cards on this phone with Dual network manager. HTC U Ultra Dual SIM card support varies by phone model, region, and country. From the Home screen, tap Menu>Settings>Dual network manager. You can turn either slot on or off, change the slot names, and more.